Thevenin theorem is used in electrical network analysis. Thevenin theorem solved problems examples are discussed in this article to make you learn this theorem. Figure shows the electrical network whose thevenin equivalent circuit is needed to be calculated. The value of VTH is calculated by open circuiting the load resistance. The voltage across the load resistance position can be calculated theoretically by applying network analysis techniques. VTH can also be determined by attaching a voltmeter in place of load resistance. 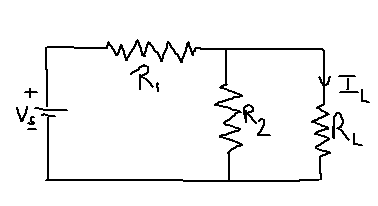 The second step is to find the value of thevenins resistance, this can be done by short circuiting all the voltage sources present in the circuit. If any current source is present open circuit it. From the terminal where load resistance was connected, calculate the equivalent resistance upto this point. 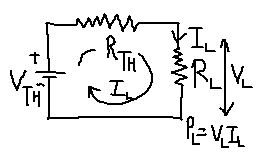 Thevenins equivalent resistance RTH thus calculated can be inserted in the equivalent circuit shown below. From the final thevenin equivalent circuit, the value of load current or power across load resistance can be calculated easily. By applying KVL or mesh analysis this can be done.